Although much has been done for developing advanced technology to bear upon real problems of individuals with sensorimotor impairments, the current situation is still far from satisfactory. Recent research in rehab robotics has enriched the functionalities of rehabilitation, assistive and prosthetic devices. However, the impact on people with real needs in the real world is still very limited. The main problem SoftPro project aims to tackle is the scarce availability of robotics rehab technology and devices – in terms of their affordability, accessibility, robustness, usability, and ultimately usefulness. The main goal is to increase the cumulative benefits of assistive robotic technologies to our society, by enhancing at the same time their effectiveness and the number of people who will benefit from them. the reduction of costs of healthcare: higher self-reliance of disabled people in doing activities of daily living will decrease the required support by formal and informal caregivers. In turn, this will reduce the burden on these groups and on society as a whole. economic and jobs growth: the SoftPro open technology will likely lead to the birth of new companies, including Spin-offs, and will strengthen existing companies by offering new market opportunities. The strong involvement of the clinical partners ensures a valid end-user orientated development and validation throughout this process. The expected impact will be made possible by investigating how the artificial, i.e. intelligent machines, can physically interact and effectively “talk to” the natural, i.e. the human body. Understanding such a “language” is crucial not only to improve performance of rehab technology, but also to tackle the most difficult problem of making it simple – simple enough to be available. Simple is not easy, however, and the path to this ambitious goal is undeniably difficult. We think that we possess good clues about such a language, whose words we believe are sensorimotor synergies – and also that we have the scientific competence to further its understanding, and the technological prowess to translate it in a new generation of robotic assistive device. the second pillar SoftPro stands on is soft robotics, i.e. the artificial implementation of the principles of impedance adaptation in natural motion control and its role in embodying intelligent manipulation and grasping behaviors. We will capitalize upon the technology of variable impedance actuation and control (where Europe is pioneer and leader), and on the availability of a new generation of “robot muscles”, i.e. 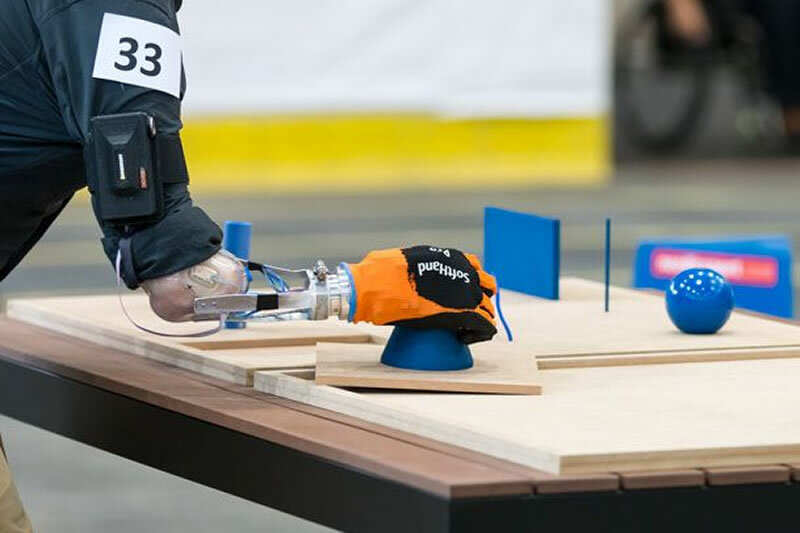 actuators capable of tuning their stiffness and impedance to adapt to the environment interaction and to the task, to realize simpler, safer, more comfortable and more effective prosthetics and rehabilitation devices. publications will be freely accessible, but also experimental data will be shared with the community for comparison and cross-checking, and software available on public online repositories under suitable open-source licenses .